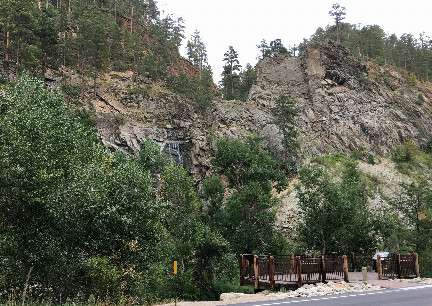 In Spearfish SD there is this road; twisting, winding, beautiful, evenly paved road that goes through the HUGE Canyon. There are Waterfalls, Pines, a Lovely CLEAR Water Fast Flowing Creek where people Fly Fish (and there were many out last night), very high set Caves, it really IS lovely. 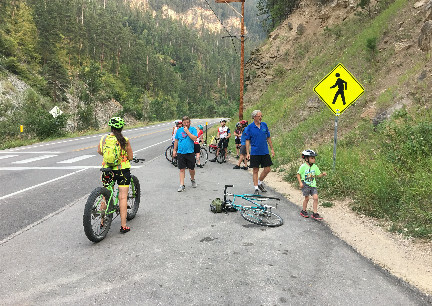 Last night a local Bicycle Group had a Group Bicycle Ride in Spearfish Canyon. I could not wait for the day to arrive! My Mountain Bicycle is down, needs repairs, waiting for parts. So I rode my FATTY. Yeah. Really. I rode my FATTY Uphill, well, incline, some areas steep.....on a FATTY Bicycle. We showed up at the, Two Wheeler Dealer, Bike Shop early, we had no idea if 5 or 500 people would be riding this. And slowly people started showing up. The family with the Daddy pulling two kids in a trailer wearing his Great Big Handlebar Mustache, Mommy had long Pink Dreds. The huge, call them, thunder thighs guy on the Road Bicycle with the skinniest, hardest, tires I believe I have ever seen in person; the woman closer my age who had a tattoo of Bicycle Wheels on her shoulder blade and she was wearing a bicycle helmet that must have cost $450 with all the lights in the front and on the sides and on the rear it had lights and arrows and..... wish I had one of those! ; there was the long haired hippy guy with the long beard and old clothes, but on a very expensive, very skinny tired Road Bike; the guy on the expensive Road Bicycle that had all the bells and whistles who was looking us all over as if it were a race and he wanted to know our abilities and weaknesses; and more and more people rode in. As these bicycle riding loving people showed up, I swear their tires were getting skinnier and mine were getting fatter. <laughs and winks> WHAT A NICE GROUP OF FOLKS! I, keep in mind, and BTW, was the old lady dressed in loud, construction zone type clothing, on the FATTY Bicycle that has seen many miles (the bike and I both) with the guy on the Mountain Bicycle in Flip Flops. There was only one other Mountain Bicycle on the ride. Soon it was 6 pm and we were off. There were 15 REALLY NICE, ADVENTUROUS, people in the group. I did ok, til about 5 miles in......we were averaging about 19 MPH from the shop through the park and the speed picked up when we hit the road. Deron and I had already ridden from Spearfish Park UP to the Bicycle Shop, now back down through the park then UP that danged hill that psychs me each time I ride it. The Canyon Road incline was hard and my FATTY bicycle tires working me like crazy. Deron and I traded bicycles for a while. I might have stopped twice and cussed and complained a bit at Deron..... ("poooor me. I am old and tired and....") He never goes for it. God Love Him. We pressed on.....me still whining. WE CLIMBED 1200 FOOT IN APPROX 7 MILES! Finally, wet from sweat and exhausted, we saw the group just ahead (about 1 mile up) at the turn around at Bridal Falls (google that, gorgeous photos online). I put on my happy face as we rode up. More than one person, several in fact, with huge smiles on their faces, told me they could not believe I made it, THAT THEY COULD NOT HAVE RIDDEN THAT BICYCLE ON THAT HILL COMING UP. (ok, I am feeling better now, verbal pats on the back will do that). Here we are. moving out about 22 MPH, and a guy, on the Skinniest Bicycle I had NOW ever seen, one of those Cannondales that cost as much as a small car that you see advertised in Magazines...or at least I think it was, BECAUSE HE PASSED US LIKE WE WERE SITTING STILL! I knew people rode that fast, but to see it, and to see it when you think YOU are going fast!!!! Would I ride it again? You know, 2 years ago we went with friends, by vehicles, up the Canyon to the Trails and Snowshoed a few miles, uphill going out. Boy that was fun, a great work out and..... So maybe I'll do THAT again! <laughs and winks> But yeah. In a Group, on my Mountain or better yet, Hybrid Bicycle, YES! I would. THINK GREEN....no not just for 'being green" riding on our bicycles.....GREEN IS FOR GO! AS IN GET OUT AND RIDE! PUSH YOURSELF FORWARD, ENJOY LIFE, IT GOES FAST FAST FAST....about like that guy on the Cannondale!